Local businesses and schools have gotten behind this worthy project. Bridgewater Art and Framing has donating kiln time, and provided all the paint and glaze for the project at a discount. Beaver Brook Farm in East Bridgewater, Bridgewater-Raynham Public Schools, and East Bridgewater Public Schools have all donated kiln time. The public is invited to join together for a meal of soup and bread on Saturday, February 15th (snow date the 16th) from 5 to 7 PM at First Parish Unitarian Universalist Church, 50 School Street, Bridgewater. 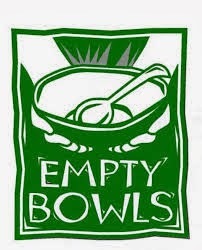 For a donation of $10, people will not only receive a meal, but also will be able to bring home a handpainted bowl of their choice, a useful keepsake and reminder of the good work of Empty Bowls, wherein funds were raised to address and prevent hunger in Bridgewater and Brockton.